The Auger Monster model AGV safely and easily screens, cleans and conveys rags and debris straight up and out of the sewer system. This gives collection system managers an affordable new way to remove rags before they clog sewage pumps, eliminating the time and expense wasted on de-ragging pumps. The vertical Auger Monster is a creative and affordable solution to 'flushable' wipes in the sewer system. It's automatic making pump stations reliable once again. Our new vertical screen joins a complete family of Auger Monster screening systems. The AGV screens at 90° while models ACE, AGE and ALE are installed at 35° or 45° for higher flow screening. The Auger Monster is popular because it incorporates an entire headworks system into one single package - a rugged Muffin Monster® or Macho Monster grinder, screen, washer, conveyor and compactor. 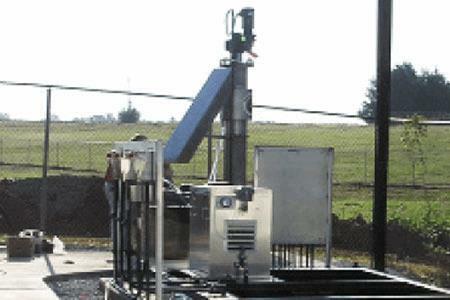 It's an affordable screening solution for small and medium sized treatment plants with flow rates up to 10 million gallons per day (1,600 m3/h). Auger Monster is also an award winning technology - winning the Water Environment Federation's prestigious Innovative Technology Award in 1997.